Where did these “Joseph Joseph” guys come from? Have I been hiding under a rock? Normally we wouldn’t review products from the same company twice in a row. But this spoon and fork set is too cool to ignore. These guys call themselves “masters of form and function” and I can’t disagree. 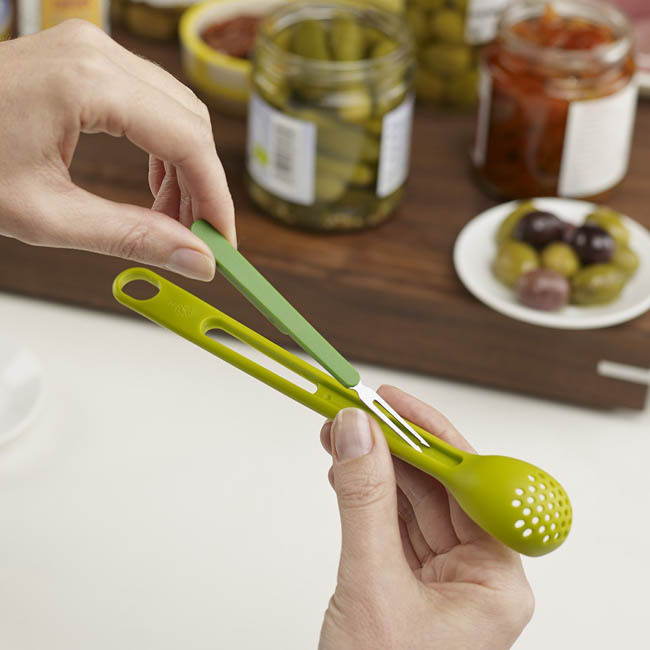 Look at this thing, it’s a clever spoon scoop for olives, pearl onions and the like. And it has a cute little tiny strainer built in. But wait there’s more! It’s got a pickle fork that snaps into the handle. What’s not to like? And it’s dishwasher safe. And it’s a great price.